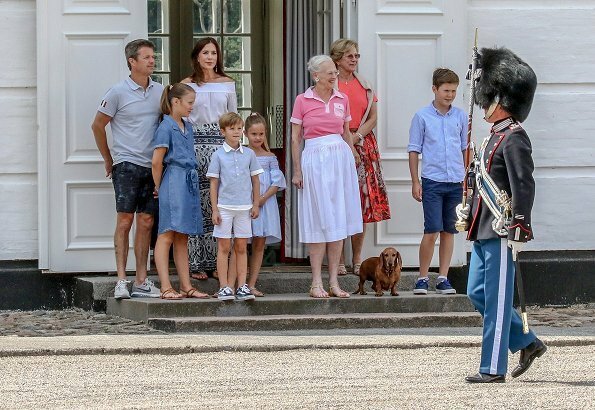 On July 20, 2018, Queen Margrethe, Crown Prince Frederik, Crown Princess Mary, Prince Christian, Princess Isabella, Prince Vincent, Princess Josephine and Queen Anne-Marie attended the Changing of the Guards at Graasten Palace. Gråsten Palace (Danish: Gråsten Slot) is best known for being the summer residence of the Danish Royal Family. It is located in Gråsten in the Jutland region of southern Denmark. Hip problems do not stop to reign, and she does it very well. Nice summer outfits for everyone. It seems everyone is relaxed and ready to play and have fun. Hope more members of the extended Family will join them at Grasten. Happy Summer everyone. Who is taking over and why? The queen is very loved so she is hopefully the one for a long time. Fredrik is behind Mary and that is so wrong. In UK Kate has find her place and Mary not in Denmark. A step behind is correct. Perhaps it is not Margreth who should be out of job. 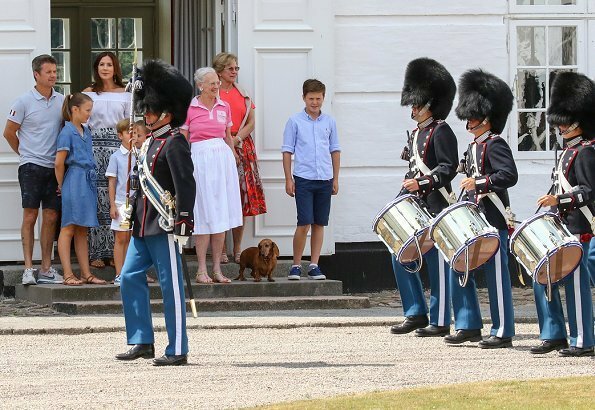 Mina, From what I can see Crown Prince Frederik is not behind Crown Princess Mary, he is simply on a lower degree than she is. 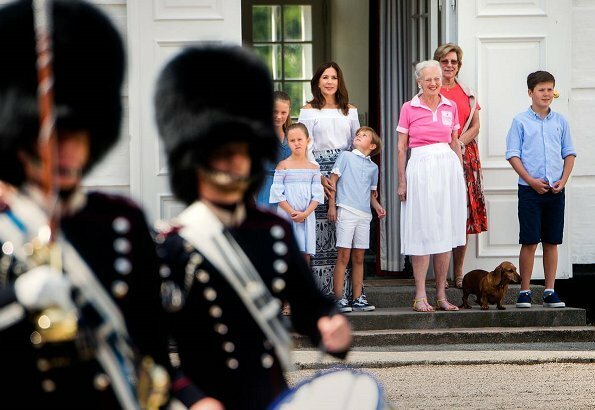 Also you need to understand that Kate's and Mary's situation is completely different: when it comes to hierarchy and royal protocol The British Royal Family is a lot more rigid and traditional than every other royal family especially when compared to the Scandinavian ones. There are a lot of things that Crown Princess Mary gets away with that The Duchess of Cambridge certainly wouldn't. 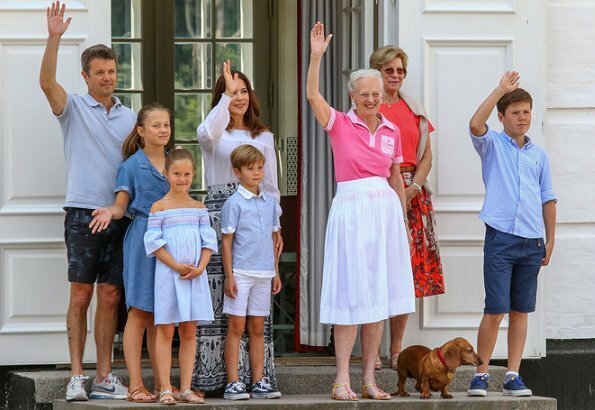 PS: I also don't think Her Majesty will abdicate anytime soon, despite how competent Crown Prince Frederik may be, Queen Margrethe is not a quitter and loves her job/country way too much. I perceive Mina's statement about Mary and Frederik in general ...... not just as who's standing where on the stairs. Mary is termed by many to be very dominant! 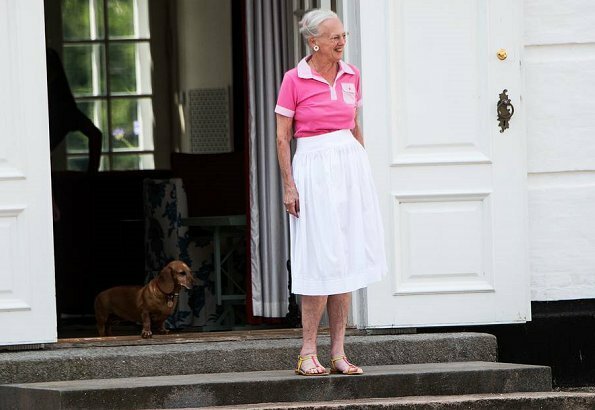 As far as I know, Queen Margrethe got two artificial knees some years ago. But she smokes too much …… it's neither healthy for the body or the bones! 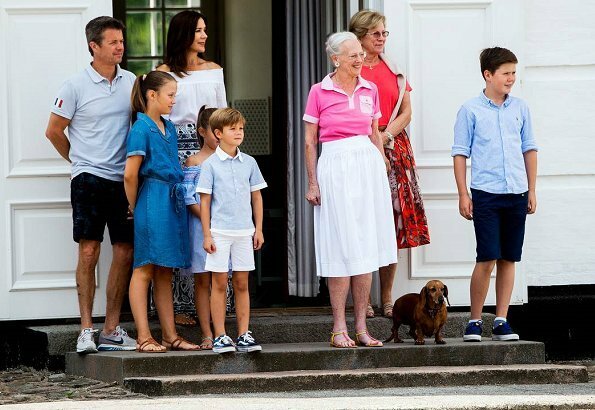 I miss Joachim, Marie and their children on the summerholiday pics …too seldem seen in the royal family! I think you look at Marie she is always ahead of Joachim even in official event she is very dominant! Joachim and Marie is not the future of Denmark they do not need to be there. The Crown Princely family is delightful. 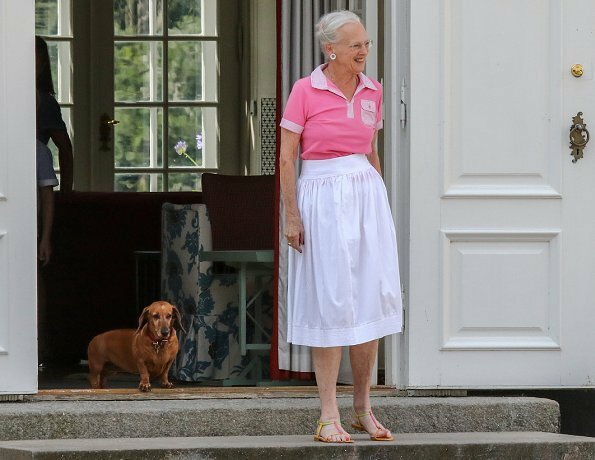 Where is Mary standing in front of Frederik she is on the step behind. Isabella and Christian grow so much, beautiful. The twins are sweet children. Anonymous, I think Mina meant Mary is mentally standing in front of, being more in public etc. I think Mary does nice work and keep her and Frederic an good example of modern equal couple. Lovely summery outfits with edge and fresh.